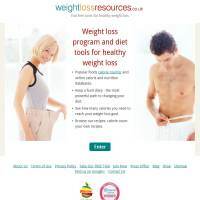 WeightLossResources provides dietary advice for people who wish to lose weight. It also offers a small variety of simple but effective tools to help you track your nutritional intake, whether you’re using on-site recipes or cooking your own food. All of this adds up to a useful tool for tracking, monitoring and adjusting your eating habits to optimise your weight loss. You can start with a free 24 hour trial to explore the site and find out if it has what you’re looking for. There’s plenty of food data on here, with thousands of popular foods covered. As such, you can check out the nutritional value of the food you’ve been eating recently, or design a plan to help support a new healthy eating schedule. It’s good to be able to view the overall nutritional values of you food, rather than just the ‘bad’ (fat, calories) bits as you can make sure you’re receiving enough nutrition in all the necessary areas. Once you’ve picked the recipes you’d like to cook for the week, you can then create shopping lists. This is really handy because it means you can easily build up a tasty menu for the week and not have to calculate the amounts of each item which you’ll need to buy. You can also adjust your meals to suit any particular health needs, such as increasing iron or decreasing sugars. Weight Loss Sources offers some pretty useful advice, such as drinking water before you eat, how to keep an effective food diary and eating eggs for breakfast. Much of the advice is based on scientific research (and you can follow links to that data) and we were pleased that they weren’t just pushing the “eat less, exercise more” mantra. Rather, it offers practical tips on losing weight and maintaining weight loss over time, with every day solutions that will fit into any life style. The site also contains online support from a community of weight loss enthusiasts. This can be really useful if you’re feeling a bit low or lacking in motivation, as you can talk it through with people who’ve been through the same problems. You can also share recipes and tips if you have any. WeightlossResources.co.uk is lacking when it comes to offering exercises to help you. In fact, it seems to be against intensive exercise altogether, which seems unusual. Still, if you’d rather control your diet than exercise to lose weight, this could be a good option. Membership prices are fair, although the customisation of the diet is a bit less in depth than we’ve seen elsewhere. Community experiences are also varied, and you may need to explore several forums to find one which is on-topic. Still, Weight Loss Resources offers plenty for its members and it’s worth giving its 1 day free trial (no credit card needed) a whirl.